After winning a combined 79 games from the 2014-2015 season to the 2016-2017 season, Maryland slid backwards last season. The Terps missed the postseason completely and must now replace a pair of NBA draft picks in Kevin Huerter (first round) and Justin Jackson (second round). Talent acquisition has been a strength for Mark Turgeon during his tenure in College Park and this season, the Terps have a strong mix of returnees and newcomers. Junior Anthony Cowan is one of the league’s most well rounded point guards. As a sophomore, Cowan logged more minutes than any other Big Ten player and averaged a team-high 15.8 points per game. He also led the Terps in assists per game (5.1), steals per game (1.5) and pulled down 4.4 rebounds per contest. Cowan will again be joined in the Maryland backcourt by Darryl Morsell, who is an above average defender with a limited offensive game. Morsell made just three 3-pointers as a freshman and made just 45.7 percent of his 2s. He’s very good at getting to the foul line (41.1 free throw rate), but needs to improve his perimeter shooting to keep defenses honest. A pair of freshmen – Eric Ayala and Aaron Wiggins – should also be a part of the backcourt rotation. The 6-foot-6 Wiggins has the size to become a difficult cover on the wing while Ayala can play both guard spots. Both were four-star recruits in Maryland’s recruiting class that finished ranked in the top 10 nationally. Another freshman, Serrel Smith Jr., isn’t as highly touted as Ayala or Wiggins, but could help provide perimeter shooting. Up front, Maryland could boast one of the league’s best duos. Bruno Fernando returns after testing the NBA draft waters and should be one of the Big Ten’s best post players. As a freshman, Fernando ranked in the top seven in the Big Ten in both offensive and defensive rebounding percentage and is appearing in the first round in several early mock drafts for 2019. Freshman McDonald’s All-American Jalen Smith is likely to slide into the starting lineup alongside Fernando. Both guys are 6-foot-10, but Smith has the skills to step out to the perimeter which should be the perfect compliment to Fernando’s bruising style. Mississippi State transfer Schnider Herard, a former top 100 recruit, will become eligible for the start of the second semester and Ivan Bender, who missed the second half of last season due to a torn meniscus, is back for his senior campaign. Joshua Tomaic, who played frequently as a freshman due to injuries, could have trouble regularly cracking the rotation as a sophomore. Bottom Line: While Maryland has had top level talent over the last four seasons, the Terps have little to show for it. Turgeon has just three NCAA tournament wins over seven seasons at Maryland and it’s fair to wonder if he’s the long term answer in College Park. The preseason projections for Maryland are all over the board as the Terps have one of the league’s most talented rosters, but there are questions as to whether they can put it all together. There’s also an FBI probe hanging over the program, which Turgeon says he’s confident will show no wrongdoing when it’s all said and done. Quotable: “I think we have seven or eight starters on this team, some are better than others. I think it’s going to allow us to be deep. I remember our 28-win team. Certain nights certain guys weren’t playing well, but we were able to plug guys in. I think that’s going to be the case with this team. I think we have enough weapons where we can plug guys in. We’re not relying on the same four guys to play great on game night every time. 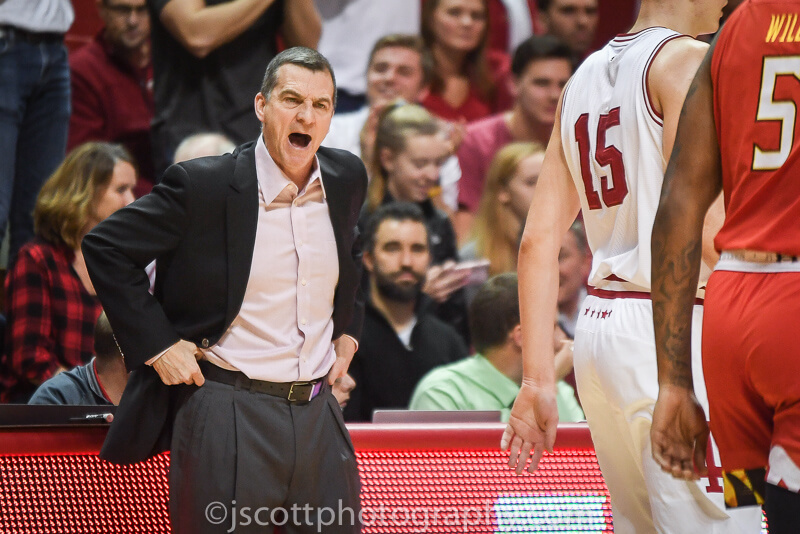 That’s a good luxury for a coach.” – Turgeon to The Baltimore Sun.